From the going away department... Dead Prez @ Red 7 tomorrow night, Aug 27th! 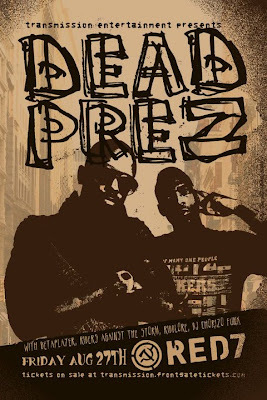 Dead Prez is a political hip hop duo from the United States, composed of stic.man and M-1, and formed in 1996. They are known for their confrontational style, combined with militant socialist and pan-Africanist lyrics. These lyrics tend to focus on social justice, critical pedagogy, activism against political repression, and corporate control over the media, especially hip-hop record labels. Dead Prez made their stance clear on their first album, declaring on the lead song, "I'm a African" that the group is "somewhere between N.W.A. and P.E.."
In 1990, M-1 headed to Tallahassee to attend FAMU (Florida Agricultural and Mechanical University) where he and stic.man met and connected due to their mutual love of music and similar political ideology. There, their views solidified, M-1 becoming particularly interested in the Black Panther Party. M-1 joined the International People's Democratic Uhuru Movement in Chicago for three years while stic.man remained behind in Florida and started getting into trouble. Burned out by the arduous labor of Uhuru, M-1 decided it was time to focus on music and stic.man agreed. Dead Prez transcribed the political education they acquired into lyrical poetry. Brand Nubian's Lord Jamar discovered them in New York and helped them sign a deal with Loud Records, but being new on a famous label like Loud (home to the Wu-Tang Clan and Mobb Deep) was not easy. 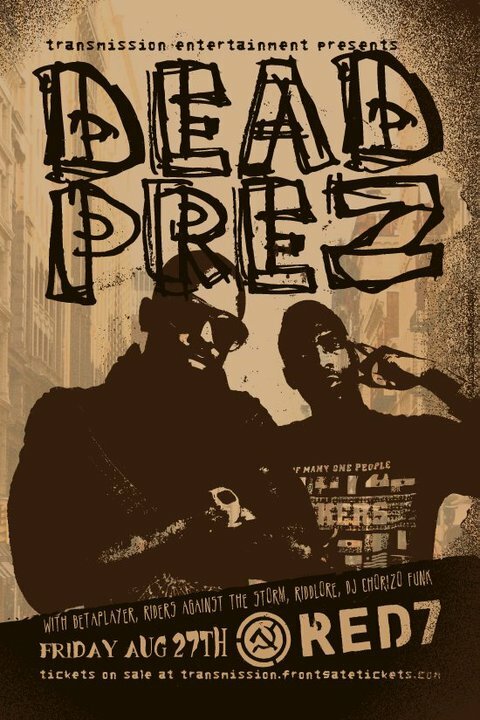 Although Dead Prez was not always Loud's top priority, they built a fan base thanks to their over-the-top performances (they've been known to ignite dollar bills and toss apples into the audiences, declaring that they must eat healthily). They also made an early appearance on Big Pun's Capital Punishment in 1998. From the dreams department... MC Overlord with Doc Deuce @ Lucky Lounge on Aug 26th! 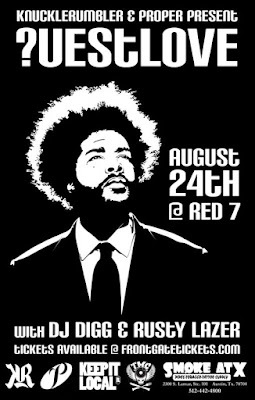 From the leaving my mark department... Questlove @ Red 7 tomorrow night, Aug 24th! Ahmir Khalib Thompson (born on January 20, 1971), known professionally as ?uestlove or Questlove (also known as BROther ?uestion, Questo or Brother Question), is an American drummer, DJ, music journalist and record producer. He is best known as the drummer for the Grammy Award-winning band The Roots, which is now the in-house band for Late Night with Jimmy Fallon. 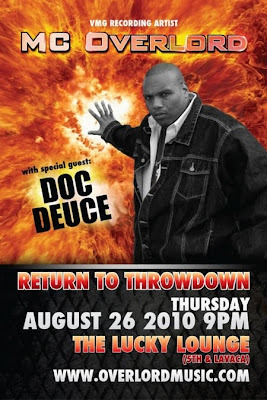 He has produced for artists such as Common, D'Angelo, and more recently, Al Green and Nikka Costa. 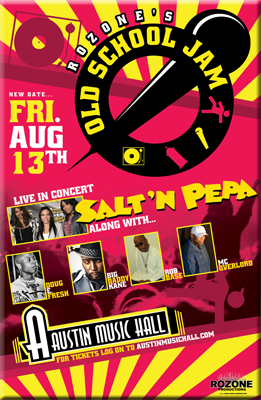 He is a member of the production teams the Soulquarians, the Grand Negaz, and The Grand Wizzards. Questlove began performing on South Street in Philadelphia using drums, while Tariq rhymed over his beats and rhythms. Later, he performed briefly in the Middle East. 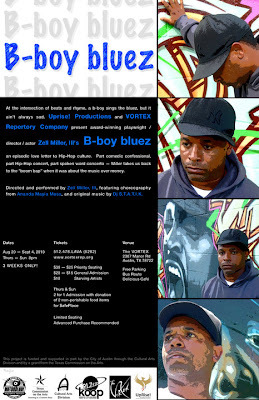 From the final farewell department.. B-boy bluez @ The Vortex Theater on Aug 20th thru Sept 4th! 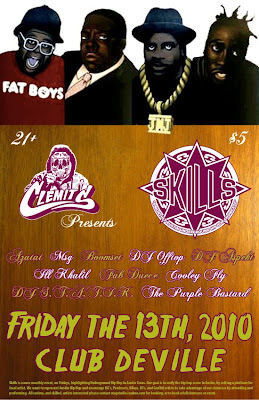 Check out the KUT special. At the intersection of beats and Rhyme, a b-boy sings the bluez, but it ain't always sad. Uprise! Productions and the Vortex Repertory Company present award-winning playwright/director/actor Zell Miller, III's B-boy bluez- an episodic love letter to Hip-Hop culture. Part comedic confessional, part Hip Hop concert, part spoken-word concerto- Miller takes us back to the "boom bap" when it was about the music over money. From the much respect department... Forever Fresh Official Hip-Hop Birthday Celebration @ Republic Live on Saturday, Aug 17th! Happy Birthday Romeo! First shot's on me! Cut to the skating rinks and house parties of South Central Los Angeles circa the late-80's and there you'd find members of Chillin Villain Empire manning the turntables and rocking the crowd. Cut to the first days of both the legendary Good Life Cafe and Project Blowed open mic nights and there you'd find members of CVE providing original productions and some of the most inspiring raps anywhere. Cut to the opening of Aceyalone's Mic Check video and there you'd find CVE showing an entire hip-hop nation how to get loose with their own unique brand of Calistylics. For the past 15 years, CVE members Riddlore, Ngafsh, and Wreccless have been tearing up stages across the globe, earning themselves quite the phenomenon of a loyal fanbase. 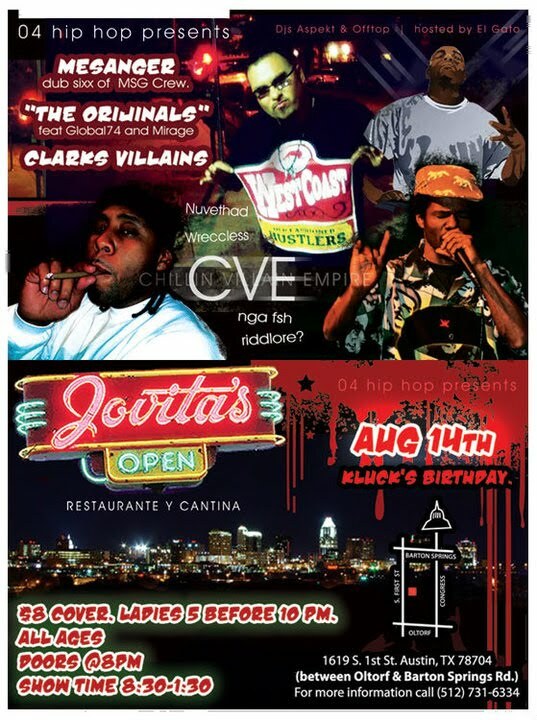 Citing Austin as their all-time favorite place to perform, CVE returns to Bat City with a gang of new material and a renewed momentum spurred on by a relatively recent addition to the group named Nevathad. Riddlore's live band side project, the Clarks Villains, will also perform, along with openers including Dub Sixx, Global74, and Mirage. The Narcisse-Banks Community Resource Center is proud to announce that the Destiny by Design afterschool program will be returning to Austin’s Kealing Middle School this Fall semester. After four consecutive, enriching semesters teaching hip-hop history, production and performance by way of the Destiny by Design afterschool program at Kealing Middle School, the Narcisse-Banks staff diverted all of its attention this past Spring to facilitating an earthquake relief mission to Haiti. When the kids at Kealing who had previously been a part of Destiny by Design heard that our curriculum director, Jules Narcisse would be traveling to Port au Prince to distribute necessities, they organized a fundraising drive on their own accord, which wound up significantly aiding the cause. This Fall, the Kealing students will surely be gratified that Destiny by Design classes will now benefit from a new contributing teacher, Riddlore of the legendary Los Angeles rap group CVE. Riddlore is stupendously proficient as both a producer and an emcee, and since relocating to Austin in ’09 has been quite active within the local scene. A rare opportunity to see his group CVE perform in Austin presents itself this Saturday night at Jovita’s on South 1st Street. Please see the attached flyer for details. In the Fall of ’08, OG of LuxuryMindz Photography produced a short documentary film on the Destiny by Design afterschool program. And just the other day, seemingly out of nowhere, none other than Sean “Diddy” Combs posted a link to the Destiny by Design documentary on his famous Diddyblog. Please visit Diddy’s site at http://www.diddyblog.com/2010/08/destiny-by-design to view the documentary and please don’t hesitate to leave a supportive comment. We at the Narcisse-Banks Community Resource Center are very thankful to our partner CitizenSchools for the opportunity to teach again at Kealing. We are also indebted to all of the artists who have contributed teaching time to the Destiny by Design afterschool program, including AC, Staci Russell, Romeo Navarro, Laura Rios, DJ Hella Yella, Tee Double, DJ Baby G, Lady Legacy, DaBosnian, Pimpin Pen, DJ Rapid Ric, and Gerald G, among many others. From the is that Coolio department... 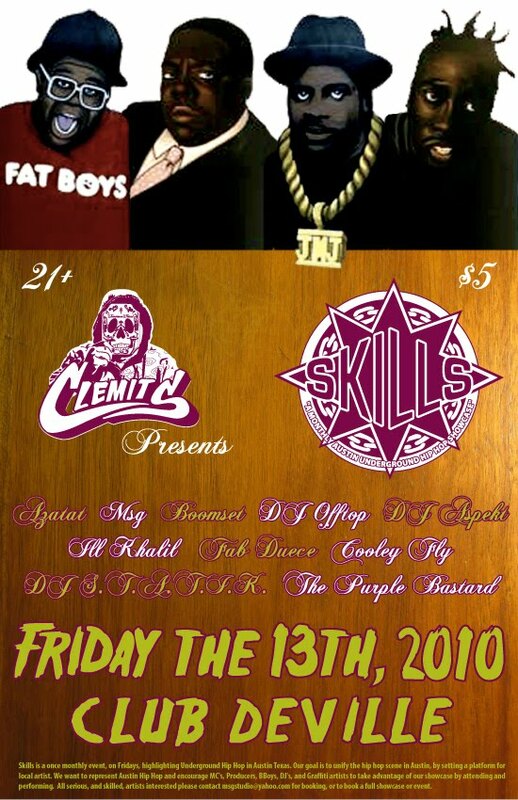 Skills @ Club de Ville on Aug 13th!